2018 repress; double LP version. Master of the fuzz saz, Turkey's answer to Eric Clapton brings his burly axe attacks to the snaky folk melodies of Anatolia. Long-proven to cause just the brain-rot you're looking for, here's a Koray collection of tracks taken from singles and LPs for your acid-drenched pleasure. The guitar slinger who was once stabbed for wearing his hair too long around the streets of Istanbul interweaves melodies as old as the ruins of Ephesus with the riffs of Black Sabbath and his own souped-up bağlama. Find out why they call him Erkin Baba. Originally released in 1976. Includes a booklet containing extensive liner notes. Technically his second LP after a collection of singles, this benchmark record from 1974 taught Istanbul's musicians and pop fans how to put Turkish folk songs from the 17th century together with meaty, thundering guitar solos. 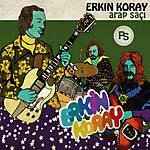 With a crack bass player by his side (Ahmet Güvenç from Bunalim and Baris Manco's Kurtalan Ekspres) and an electrified bağlama in his hands, Erkin Koray lets his gloomy baritone voice float over wiry double-reed melodies, bulging riffs, and hammer-ons that go on for-friggin'-ever. Savagery begins at home people, so make sure you get a physical copy of the best record by the Turkish Hendrix into your house. 2019 restock; Gatefold LP version. Technically his second LP after a collection of singles, this benchmark record from 1974 taught Istanbul's musicians and pop fans how to put Turkish folk songs from the 17th century together with meaty, thundering guitar solos. With a crack bass player by his side (Ahmet Güvenç from Bunalim and Baris Manco's Kurtalan Ekspres) and an electrified bağlama in his hands, Erkin Koray lets his gloomy baritone voice float over wiry double-reed melodies, bulging riffs, and hammer-ons that go on for-friggin'-ever. Savagery begins at home people, so make sure you get a physical copy of the best record by the Turkish Hendrix into your house. Turkish release, available for the first time in a while -- originally issued in the mid-90s, but always difficult to obtain. This is a reissue of material from '72/73 -- Koray's first full fledged album release. "Absolutely over the top debut album by Turkish psychedelic guitar guru. 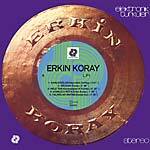 This is the rarest of all Erkin albums but also the rarest Turkish psych album ever. A total masterpiece and a must have album for any psychedelic head. Turkish pressing with 4 bonus tracks and different artwork than the original." Last copies, now deleted.